GRACE and ROCKY are at the HAM SHOP. GRACE: Rocky, you should try a bocadillo. 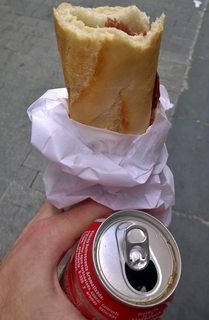 GRACE: Un bocadillo con jamon, por favor. ROCKY is at the HAM SHOP. GRACE can be seen making encouraging nods in the background. ROCKY: Hola. Un boca- bocadilla? Con, hamon, por favore, gracias. THE SHOPKEEPER hands ROCKY a ham sandwich. There is a look of recognition in the SHOPKEEPER's face. ROCKY: Cinquo bocodillos por favore.